Oil up your belly and step into the ring! 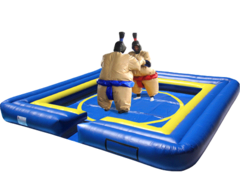 The Sumo Westling will be a hit at your next event. Everyone will be laughing & talking about the sumo suits on Monday morning! Sumo Wrestling with inflatable safety Sumo Wrestling Ring includes: 2 padded sumo wrestling suits, 2 sumo helmets, 4 wrestling mittens, inflatable safety wrestling ring, and "tons" of memories that will last a lifetime. Great for adults and large teens. Perfect for your company picnic, corporate event, church festival, or your next backyard birthday party bash!